This is an unusual kind of morning glory. The species name arborescens describes it best. It means, becoming tree-like. This is a plant with thick woody stem. It can grow like a vine with a thick stem, it can also grow into a small, multi-stemmed, low-branched tree to 4 m tall. Sometimes can be much larger, to 10 m. Outer bark mid-metallic grey, gnarled with large prominent pustular pale brown round lenticels. Leaves are broadly ovate, 3-8 cm long. All nerves are visible on the lower surface, prominent and paler than the lamina. On the upper surface - only midrib and laterals are visible, impressed. Leaf stalks are slender, 2-7 cm long. 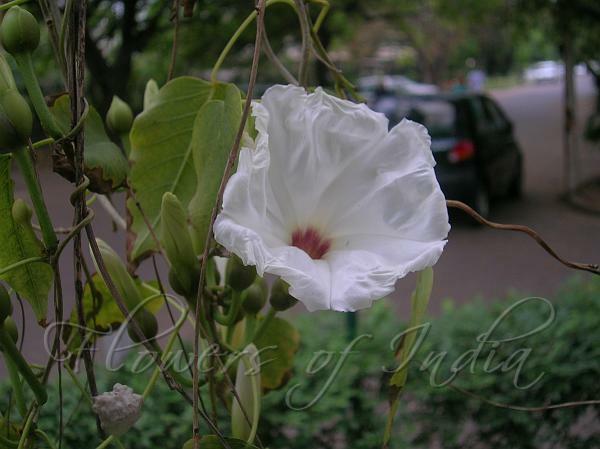 The tree morning glory has 2 inches wide, cream colored flowers with dark red centers, mostly in winter. Flower generally appear before the leaves, in few- to many-flowered panicles. This plant is variable - there are some varieties with a greenish throat. 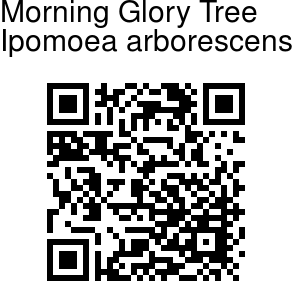 The tree morning glory is native from the state of Sonora in northwestern Mexico. Flowering: November-March. Identification credit: Pradip Krishen Photographed in Delhi & Maharashtra.